Situated in Mackinac Island, this hotel is steps from Biddle House, Robert Stuart House, and Mackinac Island Tourism Bureau. This place was SO clean! Wonderful place to stay at a super fair price. Would return! Where to find Mackinac Island hotels near an airport? Where can I find hotels in Mackinac Island that are near tourist attractions? 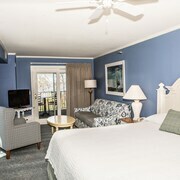 So, are you visiting Straits of Mackinac and looking to book an apartment or hotel in or near Mackinac Island? 6 hotels and apartments lie within 6 miles (10 kilometers). Why not book a convenient spot close to the heart of town? The Hotel Iroquois and Island House Hotel, are located 0.6 miles (1 kilometers) of the downtown area. 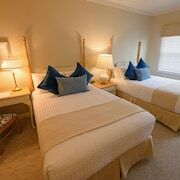 Hotel options that are near the Biddle House are the Inn At Stonecliffe and Harbour View Inn. If you would prefer to find a place near the Fort Mackinac, you could book a bed the Inn At Stonecliffe and Harbour View Inn. 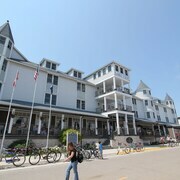 You could check out the Mackinaw Beach & Bay Inn & Suites as well as the Best Western Plus Dockside Waterfront Inn. 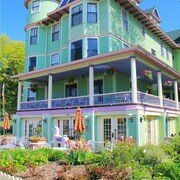 The Mackinaw Beach & Bay Inn & Suites can be found 8 miles (13 kilometers) away from the main part of Mackinac Island. 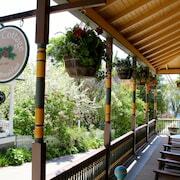 The Best Western Plus Dockside Waterfront Inn, is situated 7 miles (11 kilometers) away. The Parkside Inn Bridgeview as well as the Days Inn and Suites Bridgeview Lodge are two alternative places to stay around Mackinac Island. Why don't you investigate the other sites dotted around Northern Lower Peninsula while you are in the area? Visit Northern Lower Peninsula's lighthouses. Nature lovers should also take the time to to admire the region's lakes. In this part of United States of America travelers might enjoy snowboarding. Looking for more to do? Spend the day enjoying Castle Rock, Straits State Park and Museum of Ojibwa Culture, in St Ignace, 5 miles (8 kilometers) to the east of Mackinac Island. The Quality Inn Saint Ignace and The Breakers Resort - Lakeside are some of the apartment and hotel alternatives in St Ignace. Alternatively, you could consider staying at Mackinaw City, 7 miles (11 kilometers) to the northeast of Mackinac Island, where you'll find the Baymont Inn and Suites Mackinaw and Hamilton Inn Select Beachfront. If you stay in Mackinaw City, a couple of places to add to your itinerary are the Mackinac Bridge, Old Mackinac Point Lighthouse and Colonial Michilimackinac Park. If you love sports and love watching games you might decide to head to Otsego County Sportsplex, which is 60 miles (97 kilometers) to the north of Mackinac Island. 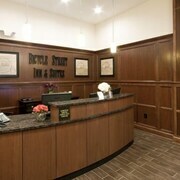 Those wanting to find a bed close by can make a choice from the Hampton Inn Gaylord or the Holiday Inn Express Gaylord. For those who choose to fly, Pellston Regional Airport is the preferred airport for Mackinac Island. A hotel that is nearby is Pellston Lodge Magnuson Hotel. What are the most popular Mackinac Island hotels? Are there hotels in other cities near Mackinac Island? 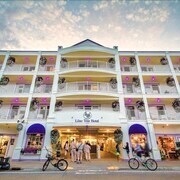 What other types of accommodations are available in Mackinac Island? Explore Mackinac Island with Expedia.ca’s Travel Guides to find the best flights, cars, holiday packages and more!